If you think high school is tough for regular kids, just imagine enrolling in Monster High—a high school for monsters! Everyone worries about passing Clawculus (especially A.P. Clawculus II—yikes! ), and Biteology is no walk through the cemetery either. Don’t even get us started on Driver’s Dead. Surviving Monster Anatomy is difficult enough, but there’s also just navigating the murky waters of regular student monster life: making friends, staying in style, catching your crush’s attention. And that can be especially difficult when you’re a foreign exchange monster, like Abbey Bominable. Not only do you have to do everything in a different language, you have to figure out little social cues and customs that no textbook can help you with. Now your little girl can look like the coolest ghoul in school thanks to this Monster High Abbey Bominable Girls Costume. The white dress is covered in blue, black, pink and purple shaped designs, with white faux trim along the collar. 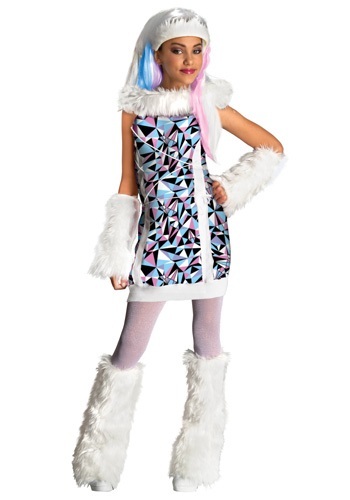 There are also matching white faux fur arm and leg warmers. To give her the full Abbey Bominable look, be sure to pair this costume with our wig and makeup kit!